Having the time to focus on your own personal and professional development – and even having the time to take a break from having to achieve – is truly significant. Being part of the world of academics often grants you this precious perk: sabbatical leave. But there are also many writers, artists, and academics who aren’t afforded paid sabbatical leave who can also benefit enormously from this time away from the day to day of their work. There are so many benefits that result from a sabbatical. Research has shown that taking a sabbatical positively impacts professional productivity and creativity, and improves overall mental and physical health. Just read Reason #9 of our 10 Reasons to Take an Unpaid or Paid Sabbatical to see why even business-focused publications like Forbes are promoting sabbaticals! Most sabbaticals involve travel and experiencing other cultures. The question is, where are you going to stay? Booking a hotel room can be cost prohibitive, while renting an Airbnb or other vacation homes may not be able to completely satisfy your sabbatical goals or work within your budget. 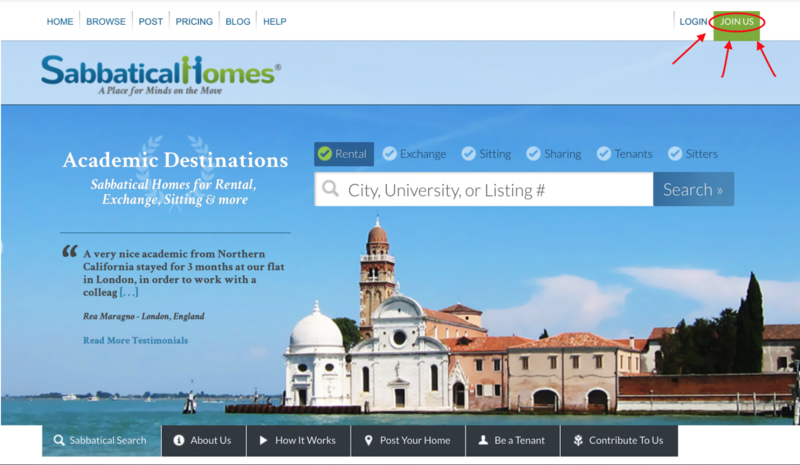 SabbaticalHomes.com was created to provide an online community in which like-minded individuals can easily find homes around the world to rent, homes to share, home exchanges, and even homes to housesit. At Sabbatical Homes, we strongly believe in the importance of providing low listing fees so all members can make a match. Sabbatical Homes has grown organically for almost 20 years, helping create connections between academics and families across many countries. We truly care about the academic community, and Sabbatical Homes is committed to providing and improving our platform in which you will connect with each other to exchange knowledge, experiences, and passions. 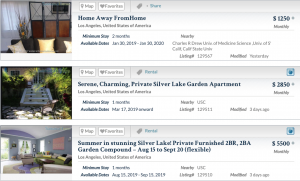 Before we detail the 5 Simple Steps to explore the possibilities, you can read a little about the differences between types of listings so you’ll really understand how SabbaticalHomes.com works. 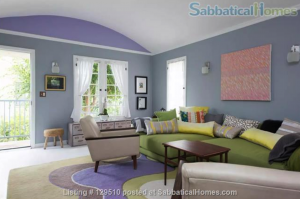 What is the Difference Between Sabbatical Home Listing Types? How Does Home Rental Work? 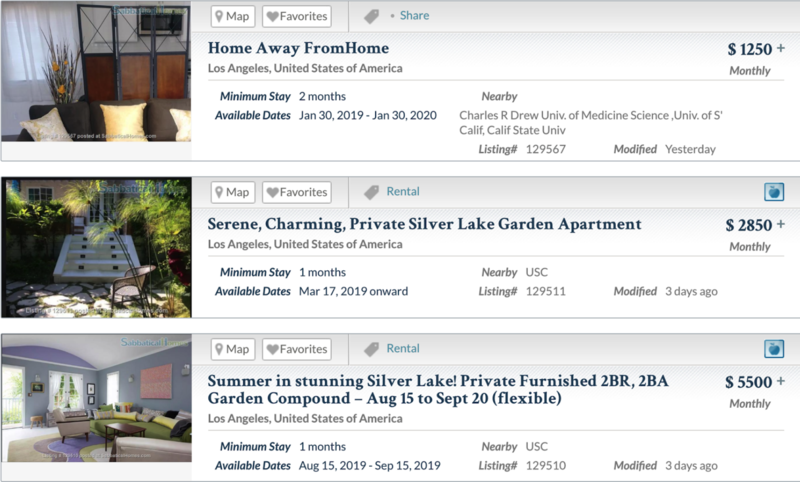 Home Rental listings are the most popular listings on Sabbatical Homes and are created by property owners who are looking to rent out their home while on sabbatical or extended vacation. 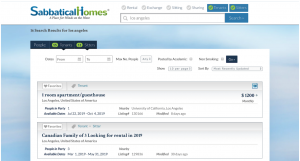 Members connect on SabbaticalHomes.com and then discuss the terms of rental and payment between themselves. We have provided many resources on our website to assist people in these agreements. Whether you are leaving to explore the world, research an ancient city, writing a book or visiting family, having a reliable, respectful tenant who will pay a reasonable amount of rent and keep your home rental in a good shape is always the goal. A Home Exchange is a very cost-effective solution for those who want to travel and enjoy staying at someone’s home while simultaneously sharing their own during their time of leave. We believe that with this win-win setup, both homeowners will be able to sleep peacefully, knowing that their house will be well taken care of by another homeowner they have interviewed and vetted. Although a home exchange is typically something which occurs simultaneously from both parties, it is not always the case as the home exchange does not necessarily have to happen at the same time. Additionally, through our exchange process, families sometimes form lasting connections with each other and being in a new location allows them to connect and network with other fellow scholars. These lasting connections, however, can of course be formed via all types of Sabbatical Home arrangements. House Sitting is a great solution for those seeking to rent out their home, but in need of extra help, whether it is watering the plants or feeding your pets. Having a House Sitter can give a homeowner the option to leave their home to a responsible tenant to take care of it for a reduced rent amount. It also gives tenants the opportunity to experience a different city or country at a lower cost than they would be able to otherwise. Usually, House Sitting does not mean that there will be no rent charged; however, most homeowners tend to reduce their rental prices if they need any help with taking care of their homes. If you are considering House Sitting, please make sure to discuss all the home responsibilities prior to your trip to make sure that both parties are clear on the expectations. How Does Home Sharing Work? Home Sharing is a perfect economically beneficial way to build new relationships within the comfort of someone else’s or your own home. You can share your home as a homeowner with other academics who need to be in your city, or you can also travel to someone else’s home yourself and enjoy the new surroundings while getting to know the homeowners. Home Sharing usually consists of the homeowner allowing a guest to use a spare room or space they have within their home while the homeowner is there. Most people have multiple conversations before agreeing to a Home Sharing situation to make sure everyone is compatible and flexible on all of the details of sharing space with others. Before your journey begins, you must create a member profile on our website. 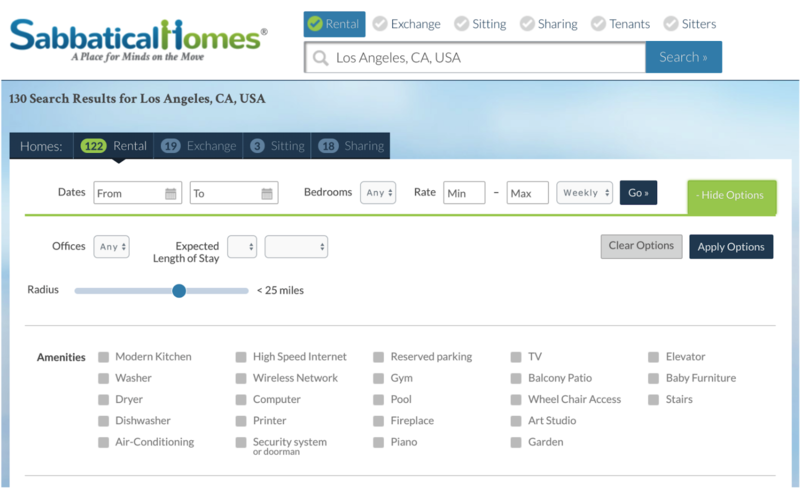 Creating a member profile with Sabbatical Homes is easy and free of charge. Next, fill out information about yourself. Please make sure to provide honest information as it is important for us to keep our community safe and legitimate. Please keep in mind that you may be asked for your academic email and confirm your academic background to qualify for our lowest listing fees, but our listing fees for non-Academics are also very reasonable. Welcome to the Sabbatical Homes community! Once you have completed your registration, you will have full access to all the features that our website provides for you. 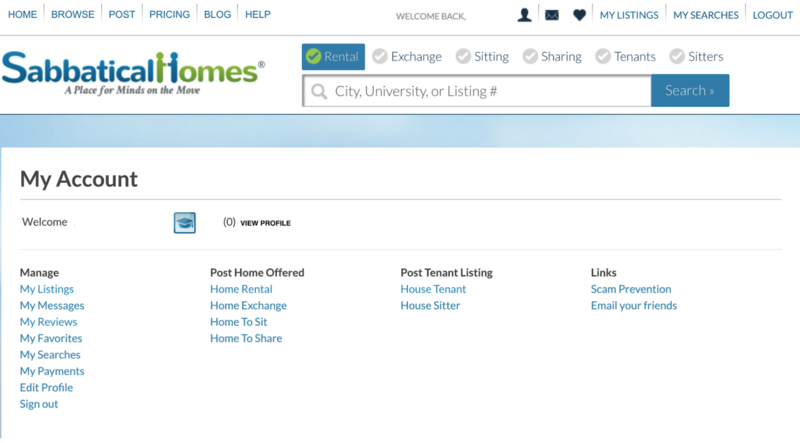 You will now be able to post a Tenant listing, save your favorite listings to “My Favorites” and message other members of the Sabbatical Homes community. A fee will apply if you wish to post a Home Offered Listing. Choose what type of listing you want to post (scroll down for more detail on the types of listings). Many members post both types of listings simultaneously if they are looking for a home to stay in and also looking to rent out or possibly exchange their own home for a sabbatical. A Home Offered Listing is a listing created by an owner of the property. 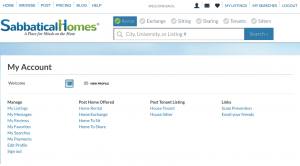 The Home Offered category includes four types of listings: Home Rental, Home Exchange, Home to Sit, Home to Share. 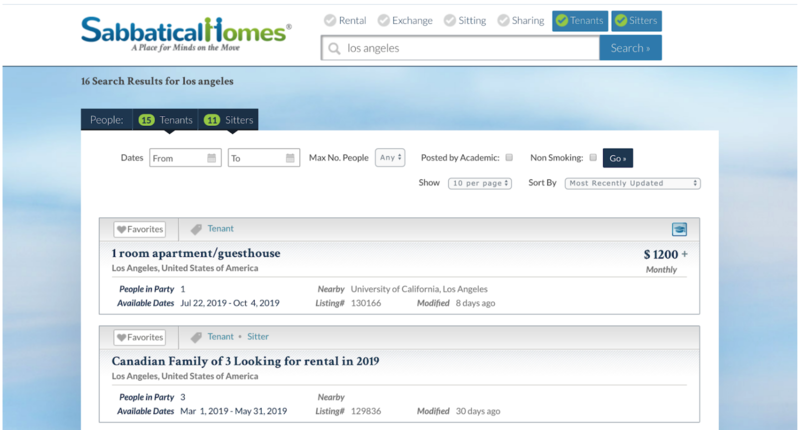 Each type of listing has special features to allow you to make a match with other members looking for temporary housing. If you are thinking of taking a sabbatical and want to explore locations and options, the Home Wanted or Tenant Listing is a great tool to find out what the possibilities may be. Fill out the forms with the necessary information and be as detailed as possible to make the best match on SabbaticalHomes.com. Both types of listings include tips that will help guide you through the application process, and required fields will have a red asterisk next to them. Once you completed your application, press “Add Listing” in the very bottom of your page. Paying is easy on Sabbatical Homes. The fee schedule is below, please note the pricing is different to create a Home Offered Listing or Home Wanted/Tenant Listing. There is also different pricing for those in the Academic community and those not in the Academic community. 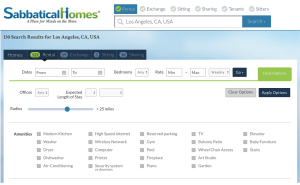 Because we do not charge additional fees to the listing fees, in order to maintain our high level of service and keep the website free of advertising, SabbaticalHomes.com also asks our members to make a contribution each time they make a match with another member. Average contribution amounts range from $50-100 per match. We appreciate our members’ integrity in following up with this contribution, allowing us to keep the website running and to develop new services for our members. Listings can remain active for up to 12 months from the submission date and can be updated and renewed at any time. If you have more than one property to list, each property will have its own listing number, information, and fee. Listing and renewal fees apply to each individual property. If you are an agent or a broker or have a property with multiple units, please contact us. For commercial listings, higher rates apply. Submit your listing (if you already have, login to your account). Click “Pay Now” next to your listing. If you don’t have a PayPal account or don’t want to use one, you can just use your credit card. To do so, select “Pay with a debit or credit card” button. If you are having problems processing your payment, you can make a direct payment via PayPal to the following email: CustomerService@sabbaticalhomes.com. Make sure to enter your listing number in the notes section of your PayPal payment. This does not happen often; however, it is possible to experience a lag in updating your payment information. If after 24 hours your information still has not updated, please contact us. To negotiate your fees and arrange payments for your rent, please contact your host directly. Many find it convenient to receive payments via PayPal, check, or other person-to-person mobile transfer services. Be aware of scammers. If the tenant asks to send a check for more than the rental price and requests that the host refunds the difference, or proposes to make a payment through a friend or agent, usually those come from international sources and the scammer is only fabricating a reason for you to send them quick money. Our service relies on our users, we are able to keep our fees low and the website advertisement-free thanks to all of the donations from our warm members here at Sabbatical Homes. The amount you contribute is left to your discretion; however, typical contributions range between $50-$100. These contributions make up a large part of our revenue and allow us to keep the website running and to develop new services for our members. We believe in keeping our fees to a minimum, there are no hidden costs, such as commission rates or booking fees. If you and your host or tenant find each other through our website, we kindly ask you to give back and help us grow and improve, for you! We appreciate your contribution and support! 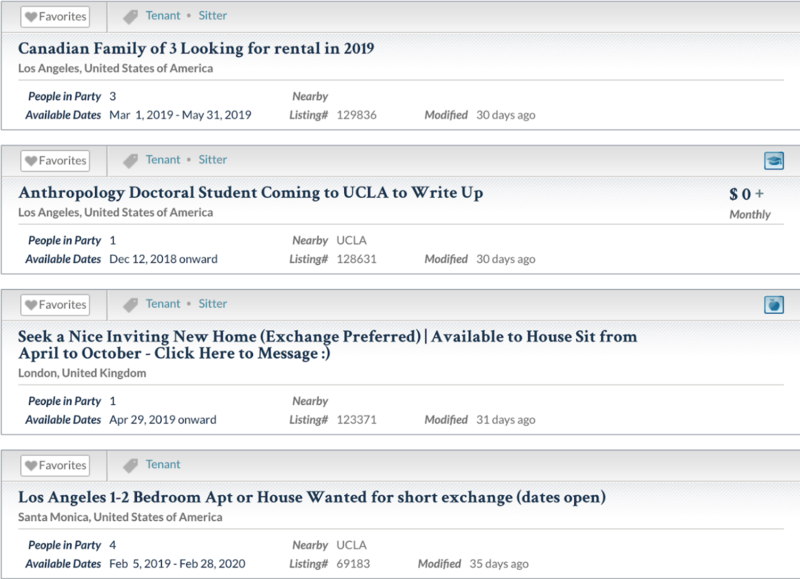 Enter your desired location in the search bar on the top right side of the site—here you can type in the city, university, or address you that you want to be close to. 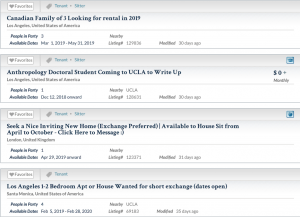 Select as many tabs as you wish: Rental – if you are looking for Homes For Rent; Exchange – if you are looking for Exchanging Homes with other academics; Sitting – if you want to take care of somebody else’s home for a lower rental charge; Sharing – if you are looking to make your experience even more “like home” and stay in a shared part of someone else’s home.The “Rental” listing is selected by default; however, you can select multiple options. 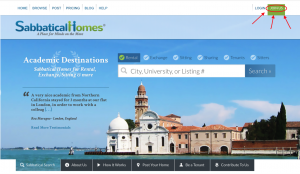 If you wish to narrow down your results, use our powerful filters based on your personal criteria, such as date, rates of the rental, number of rooms and more.If you have special requirements for the place you wish to stay at you can also create a Tenant Listing that will let mention what exactly it is that you are looking for and when. Once you have a list of homes in the city you are looking to take a sabbatical in, email the owners to find out if you are both the right fit. You can use all the resources and suggestions on SabbaticalHomes.com to come to an agreement on pricing and parameters. Go to the SabbaticalHomes.com Home Page. Enter your destination city into the search bar on the top right-hand side of our site and choose from the drop-down menu that is populated when you type. In the section above the bar, select “Tenants” and/or “Sitters”Before you press the search button make sure to deselect the default “Rental” checked box above the search bar so that your search results will only include tenants looking for a place in the location of your home. Scroll through the Home Wanted/Tenant Listings that other members have created to see if any match what you are looking for and contact those that look promising to start the conversation. The Review feature was created to provide an opportunity for the Sabbatical Homes community to share fair and useful information about other members and their listings. All members are encouraged to post reviews about those they have interacted with or the properties that they have rented. Comments are visible to everyone. To read a member’s review, please click the “Reviews” section on a member’s profile. All the reviews you write or receive are kept in your account for future reference. You cannot delete a review after it is posted. If you must delete a comment, please contact us. Follow the screen prompts to find the person or listing you’d like to review. To receive feedback, the person must be a member of the Sabbatical Homes community and the parties involved must have exchanged one email with each other as members. Your review will immediately be posted on the other party’s profile. Note that Reviews cannot be edited. Only SabbaticalHomes.com has the right to edit or cancel reviews if they do not pass our Review guidelines or are found to be inappropriate. We are always happy to hear from you! If you would like to reach out and submit a compliment or a complaint to the Sabbatical Homes team, please contact us and share your experience. This article was made to help you explore our website with ease. We thank you and hope that you have a wonderful experience on SabbaticalHomes.com.